Phantom Cardboard: I Thought He Just Flew In For Games! I Thought He Just Flew In For Games! I would put 1982's Fast Times At Ridgemont High in my top 5 all-time. It's hard to think of any movie capturing a decade like Fast Times did with the 1980s. Charles Jefferson was a great character, especially seeing as it was Forest Whitaker's first role of note and he's went on to have quite a career which included the 2007 Best Actor nod for his portrayal of dictator Ida Amin in The Last King of Scotland. For the character I actually made two cards. 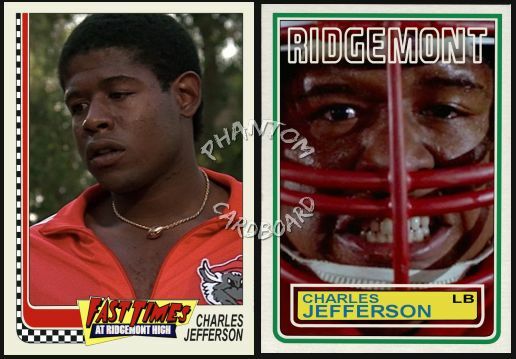 One I would call regular inspired by the 1982 Topps baseball set, and also a football card inspired by the 1983 Topps football since since Charles Jefferson was such a killer on the gridiron. For the regular Fast Times card I went with a checkerboard design to the first side swoosh, which of course is as a tribute to Jeff Spicoli's Vans that were made iconic by the movie. I also added the Fast Times logo for a nice little movie card touch. For the football card I called a audible from my usual preference to use the same year card design that the movie or what ever I'm doing a card of was released. 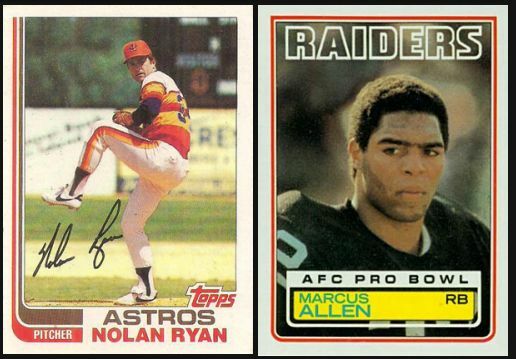 The '82 Topps football has an illustrated football helmet that I just couldn't seem to reproduce and keep a vintage look to it, so I went with the '83 design which I think worked out pretty well, I mean you can't tell me that's not a mean looking card! I decided to use "Ridgemont" as opposed to the team name like the Topps NFL cards all had just because it's way more recognizable than "Wolves".